The first Washing Machine of 2018 saw DRUIDS rock out to a sold-out Hunter Club on Saturday (20th December). Saturday’s gig kicked off with the grunge-rock of GROUTS, a mysterious four-piece duo whose set was filled with snarling, distorted riffs and thrashing drums. The Interesting Times Gang followed up next with their quirky, catchy tracks about their sci-fi adventures, listen to them on Soundcloud! Stealing Signs gained themselves a new fan after their set, so much so that I treated myself to their new EP on WHITE VINYL! Something about them made me hooked from the off, their smooth riffs which lifted anthemically in each track and their lead singer’s incredible vocals could be a factor. They definitely know how to write a great alt-rock track, without a doubt my favourite track of the set was the jingly groove of You Will Be. The band will definitely be back in the near future at a Washing Machine, so go and see them and be blown away. Finally, the headline act DRUIDS took to the stage. Having listened to their latest album all week, I was definitely excited about their set and they certainly didn’t disappoint. Launching their new EP, they played the title track Up To Mars which was very well-received by the packed crowd, however even more so when Washing Machine legend Seymour Quigley joined the band wearing a Jean-Lou Picard mask (he had been spotted in the audience by the band earlier in their set). As well as tracks from the new EP, they played several ‘old favourites’ in the triumphant Mission and the really rather good Stuart Slater Alligator. 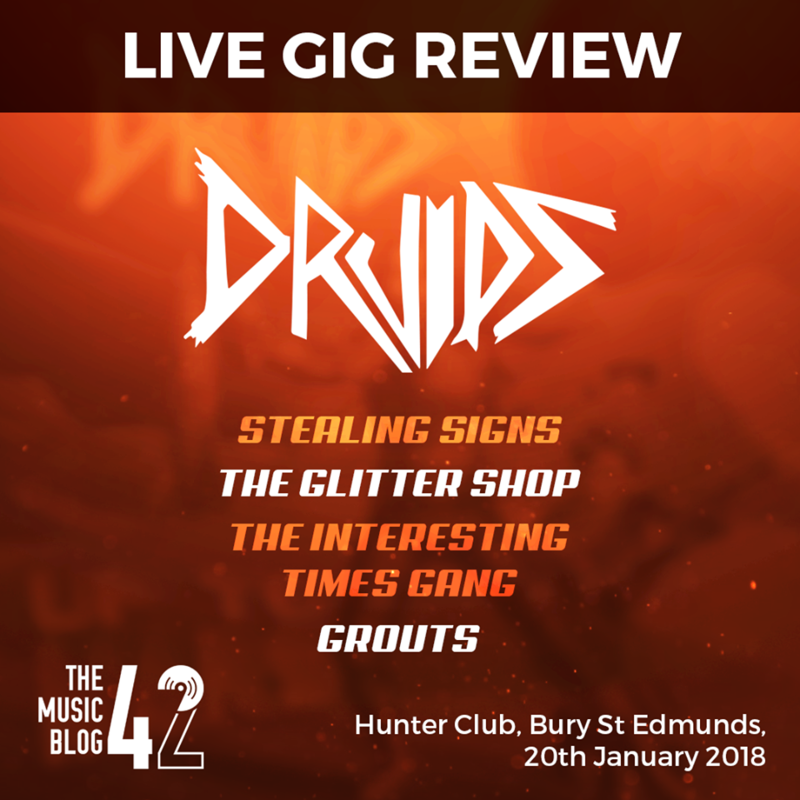 If you’re a fan of intense basslines and thumping drums, you’ll love DRUIDS! Once again another great night of music at The Hunter Club, filled with bands that you all need to listen to RIGHT NOW!